(Phys.org)—Coyotes living in cities don't ever stray from their mates, and stay with each other till death do them part, according to a new study. The finding sheds light on why the North American cousin of the dog and wolf, which is originally native to deserts and plains, is thriving today in urban areas. 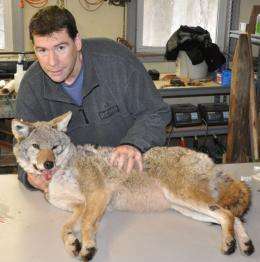 Scientists with Ohio State University who genetically sampled 236 coyotes in the Chicago area over a six-year period found no evidence of polygamy - of the animals having more than one mate - nor of one mate ever leaving another while the other was still alive. This was even though the coyotes exist in high population densities and have plenty of food to eat, which are conditions that often lead other dog family members, such as some fox species, to stray from their normal monogamy. To cat around, as it were. "I was surprised we didn't find any cheating going on," said study co-author Stan Gehrt, a wildlife ecologist with Ohio State's School of Environment and Natural Resources. "Even with all the opportunities for the coyotes to philander, they really don't. "In contrast to studies of other presumably monogamous species that were later found to be cheating, such as arctic foxes and mountain bluebirds, we found incredible loyalty to partners in the study population." The study appears in a recent issue of The Journal of Mammalogy. The loyalty of coyotes to their mates may be a key to their success in urban areas, according to Gehrt. Not only does a female coyote have the natural ability to produce large litters of young during times of abundance, such as when living in food-rich cities, she has a faithful partner to help raise them all. "If the female were to try to raise those large litters by herself, she wouldn't be able to do it," said Gehrt, who holds appointments with the university's Ohio Agricultural Research and Development Center and Ohio State University Extension. "But the male spends just as much time helping to raise those pups as the female does." Unlike the males of polygamous species, a male coyote "knows that every one of those pups is his offspring" and has a clear genetic stake in helping them survive, Gehrt said. The research was done in Cook, Kane, DuPage and McHenry counties in northeast Illinois. All are in greater Chicago, which is home to about 9 million people and is the third-largest metropolitan area in the U.S. It's also home to an estimated 1,000 to 2,000 coyotes. Gehrt has previously said he "couldn't find an area in Chicago where there weren't coyotes." "You've got lots of coyotes in this landscape," said senior author Cecilia Hennessy, who conducted the study as a master's degree advisee of Gehrt and is now a doctoral student at Purdue University in Indiana. "You've got territories that abut each other. And coyotes can make long-distance forays. So you'd think, based on previous investigations of dog behavior, that cheating would be likely. "But to find nothing, absolutely nothing, no evidence whatsoever of anything that wasn't monogamy, I was very surprised by that," she said. The finding came through a wider study of Chicago-area coyotes that Gehrt has led since 2000. As the largest study ever on urban coyotes, it's a long-term effort to understand the animals' population ecology, how they adapt to urban life and how to reduce their conflicts with people. "A powerful part of the new paper is that we have long-term field work, behavior observations, to accompany Cecilia's genetic work," Gehrt said. "So many genetic studies only analyze samples but know very little about their subjects, whereas we follow these individuals nearly every day and often to the completion of their lives. It's a nice mesh of lab and field work." The scientists used live traps - either padded foothold traps or non-choking neck snares - to catch the coyotes for the study, although pups were simply dug from their dens and held by hand. Small blood and tissue samples were taken from all the animals. The adults, which were anesthetized, also were fitted with radio-collars for tracking their movements and ranges. Afterward, all the coyotes were released where they were caught. Later, Hennessy, who previously was a plant genetics technician and biology major at the University of Cincinnati, used genetic techniques in the lab to test the animals' DNA and determine their family trees. Coyotes maintain monogamy through long-term pair bonding, a term meaning an animal stays with the same mate for more than one breeding season, and sometimes for many. A male coyote, for his part, practices diligent mate guarding - keeping other males away from the female. During estrus, which is the time when the female can become pregnant, the pair "will spend all their time together - running, finding food, marking their territory. They'll always be right at each other's side." "We've been able to follow some of these alpha pairs through time, and we've had some of them stay together for up to 10 years," Gehrt said. "They separate only upon the death of one of the individuals, so they truly adhere to that philosophy, 'Till death do us part,' " Hennessy said.